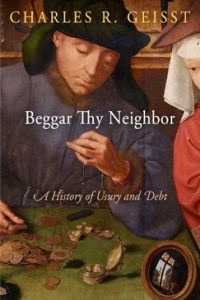 In his latest work Beggar Thy Neighbor: A History of Usury and Debt Charles R. Geisst explores the history of the development and regulation of charging unfair interest, or usury. This book, he writes, serves to “underscore both the seriousness and the ambiguity that debt has occupied in banking and finance for three thousand years” (p. 332), and believes understanding this history is crucial to understanding our current financial situation. Beginning with an account of a dispute between Cicero and Marcus Brutus concerning the would-be-assassin’s money lending practices, professor Geisst traces the institution of usury to the recent Global Financial Crisis. The Ambassador Charles A. Gargano Professor of Finance at Manhattan College, Geisst examines the collection of interest during several key periods of global history, including the Roman era, Medieval Europe, the Renaissance, the Enlightenment, as well as the present day. Usury has long been viewed negatively because unethical individuals and groups exploited borrowers. To the ancient Greeks, the Romans, and even pre-Islamic cultures, collecting interest represented a possible way to impoverish people. Such an act, scholars and intellectuals claimed, violated natural laws. Geisst takes this idea and expands on this principle in practice. What he illustrates is that despite cultural or legal barriers to usury, a society often finds ways to integrate predatory lending into elements of their world. What was once seen as a violation of natural law, for instance, usury is now accepted as a standard accompaniment to the modern market economy. Indeed, one of Geisst’s most damning arguments concerning the practice is that while the United States has attempted to eliminate or severely regulate compound interest and usury, citizens and consumers regularly encounter high mortgage payments, pay-day loans, and pawnshops. Geisst’s first three chapters deal almost exclusively with how law and governments from antiquity to the Reformation sought to regulate usury and eliminate it from daily life. Until the Middle Ages, Western society imposed strict regulations on excessive interest. As Christian Europe entered the Early Modern period, individuals and governments relaxed their previous usury restrictions. His second chapter, entitled “Embracing Shylock,” shrewdly demonstrates how Renaissance Europe allowed usury to thrive outside of accepted society but under supervision. This vision of society illustrated by Shakespeare is juxtaposed to Shakespeare’s reality, wherein 17th and 18th-century culture accepted moneylenders as a part of the developing global market. The most original chapter, Geisst’s use of literature, finance, and history to examine how Western society changed its views on usury as a violation of natural law is quite convincing. His fourth, fifth, and sixth chapters discuss the role of debt in banking in the nineteenth century, the ease of credit acquisition in the twentieth century, and the establishment of credit to nation states and their defaults overseen by more economically powerful states, respectively. His eighth chapter concludes that, by the end of the 1970s, most consumers ignored debt and focused on credit, as that designator seemed to determine a person’s lifestyle. He notes that by the end of the 1970s credit had outmaneuvered debt as the most significant indicator of personal or corporate success. In the United States, when credit was easy to acquire, debt grew at outrageous rates. In order to take advantage of this new consumer culture, credit card companies not only established policies that made paying off debt a long and more costly endeavor, but also lobbied Congress to make bankruptcy harder to declare. Geisst’s point here is that consumers and government officials did not understand how debt and debt acquisition operated in practice. The seventh chapter stands out as the only example of non-Western or at least non-traditional finance in the modern world. Geisst argues that the rise of sharia law in the 1970s Muslim world jumpstarted a reconsideration of the Koran’s prohibition of usury. Through the Koran and various Western intellectuals, whose arguments against predatory lending and compound interest collection were canon in Christian society up to the Middle Ages, Islamic states such as Saudi Arabia, Sudan, and many others began making financial services sharia compliant. Furthermore, Islamic societies and institutions such as the 2006 Nobel Peace Prize winning Grameen Bank embraced micro lending (loans to the poor), which not only followed the Koran’s regulations but also helped families get out of poverty while fostering communities. The incredible growth and expansion of the Muslim financial sector in the twenty-first century brought on complications, however, as bankers sought to encourage further economic growth while being confined to religious and cultural laws that slowed rapid prosperity. Understanding all this history is necessary to avoid the kinds of financial issues like the Global Financial Crisis from reoccurring according to Geisst. He repeatedly addresses how predatory money lending continued because groups of individuals not only understood how usury truly works, but also how to navigate through existing laws. Credit-lending institutions, focused on profiting from the expansion of credit, circumvented standing laws and constructed the disastrous consumer credit system whose collapse in 2007 initiated the Global Financial Crisis. Unfortunately, Professor Geisst does not seem optimistic about the future of usury in the United States. Despite the success of the Dodd-Frank Wall Street Reform Act in passing through Congress, usury is not recognized as a serious problem. In fact, as Geisst notes, the Dodd-Frank Act is clear that only Congress may create limits on usury, not the individuals or organizations charged with overseeing and understanding usury’s role in the economy. Beggar Thy Neighbor is certainly an informative examination of one of history’s lesser-understood institutions. Some readers may find that while his secondary sources are well chosen, Geisst’s reliance on translated works and classics from the Renaissance and Enlightenment privileges a Western, if not Eurocentric, model of finance above other forms. The chapter on Islamic finance, for example, seems out of place and leaves the reader wondering about other financial models created to counter the traditional Western system. Perhaps more problematic for the general reader, Geisst regularly fails to define some of his terms, routinely jumps back and forth between thoughts, and often composes awkwardly written prose. These criticisms are minor, however, and should not takeaway from this excellent introduction to the history and implications of usury.